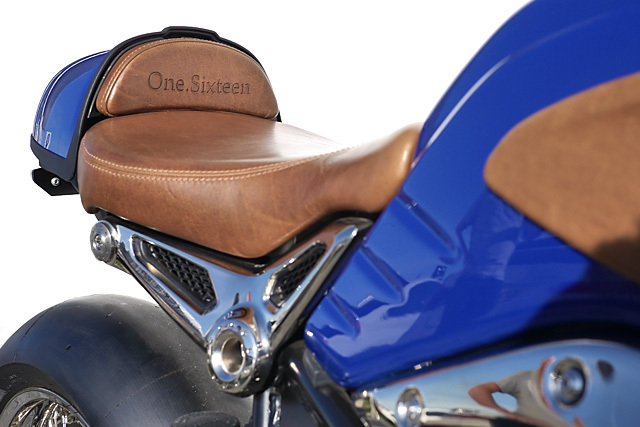 “The One.Sixteen was built by Stuart Hill at Chandlers Bikes in Brighton,” says Chandlers stalwart Rory Milton. Apparently builder Stuart worked his way through the Harley Academy before moving to BMW bikes a few years ago. 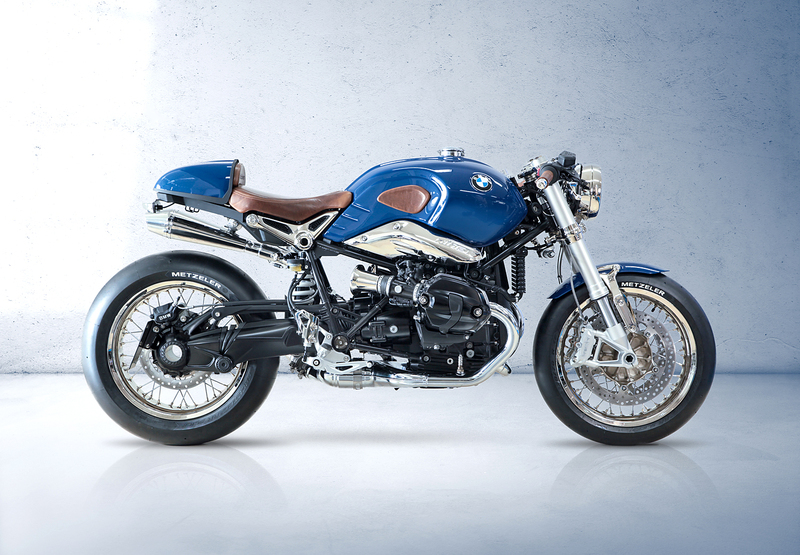 “The project was overseen and stressed over by me, Rory, a keen fan of bike customisation and learning new tricks and techniques.” Both these strapping young lads are based at a Motorrad retailer situated in the south of England, and it’s plain to see that they love to see what we can do with the core BMW range in their spare time. So what inspired this purplish perfection? 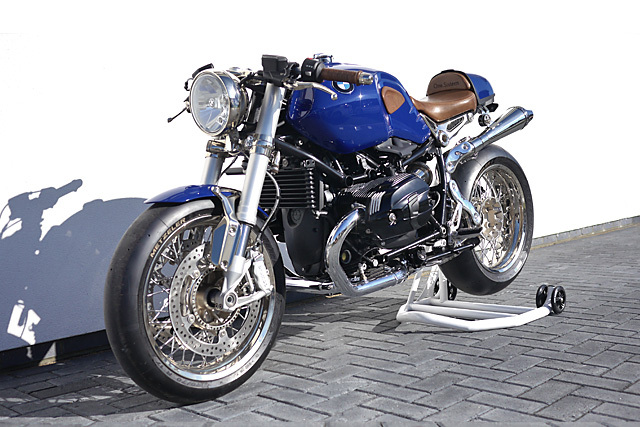 “In a passing conversation with a BMW employee, we mentioned that we were playing with a couple of R nineT bikes to see what we could create. 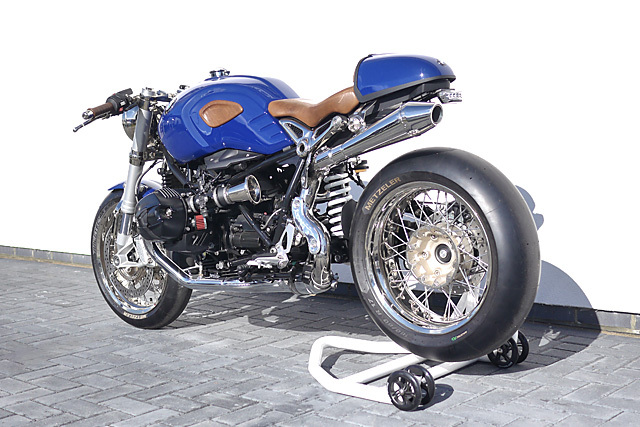 Later that day we received a phone call asking if we wanted to produce a one-off bike to be displayed at the Goodwood Festival of Speed. 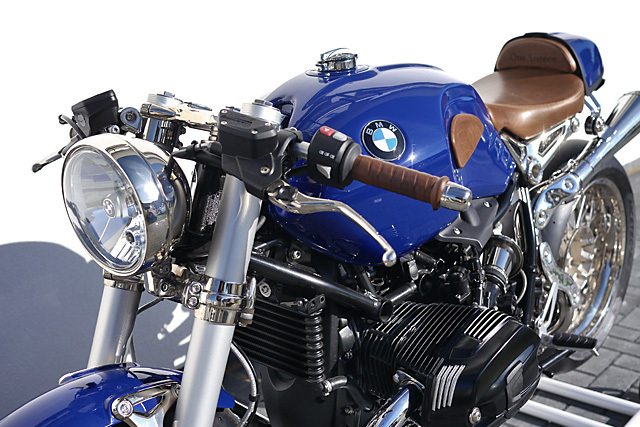 Did we want to build a custom bike for the biggest event in the British Motorsport calendar? 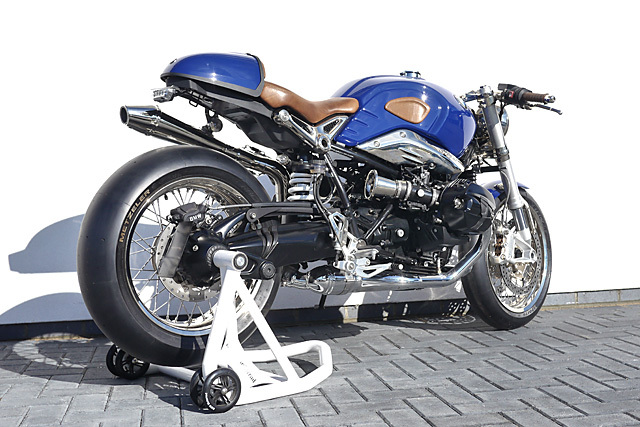 Of course we bloody did!” As such, they set themselves a brief to put together a motorcycle that looked like it had the factory BMW finish but honoured the rich heritage of the Goodwood event. 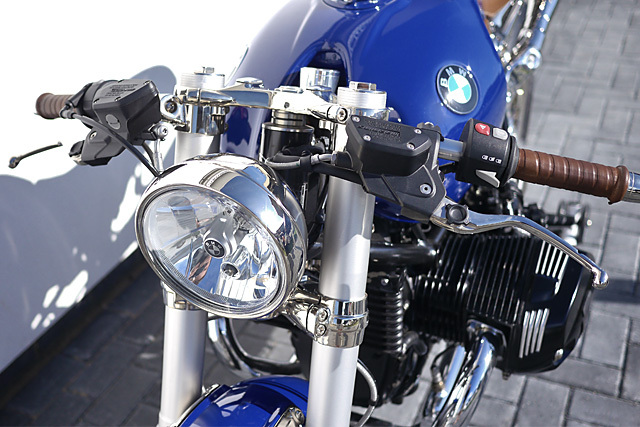 “We only had a three week lead time to turn around a standard R nineT straight out of the crate, and all of the work had to be done outside of our normal working day, so we had to go ‘all in’ to get the bike completed in time,” says a very tired Rory. Within the space of two very late nights, the bike was stripped to nothing but a main frame housing, the block and heads. The next step was to take the external components off the drive train that were to be painted black to match the engine. “Then we needed to remount the ignition barrel in order to house the retro-look speedo in the front of the tank,” Rory notes. But things weren’t all smooth sailing. 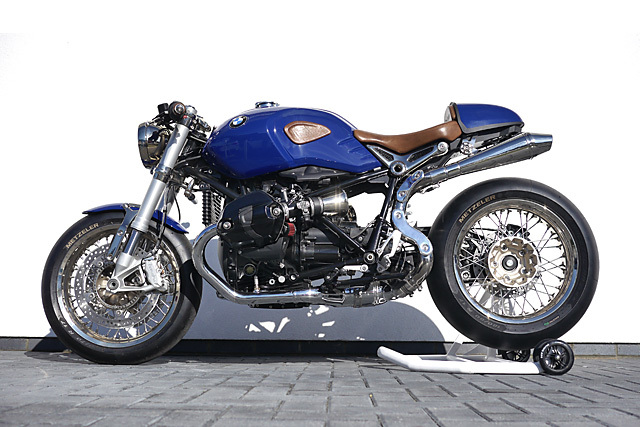 “We had played with basic customising on a bike or two but this was going to need us to fabricate, relocate units and even delve into the fearful BMW electrical Can-Bus system.” With only three weeks to complete the work and no existing contacts to arrange some of the finishing, they had to form some very firm friendships very quickly. “We messed up a pair of wheels at one point, too. The best advice we received to strip them was to have them blasted but the first place we tried went in far too coarse and it completely ruined them.” Sounds painful. Challenges were a dime a dozen, but one sticks in Rory’s head. “The reworked, hand shaped ‘R nine-T’ signature scoop took a lot of time and effort to meet the factory finish I was looking for. 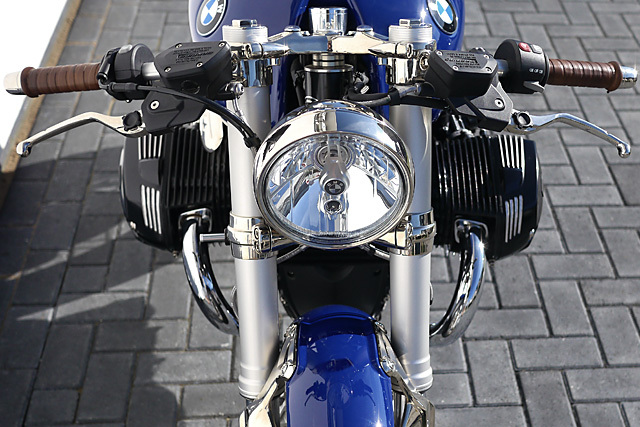 With the removal of the air scoop below it was one of those necessary changes, but we managed to work it in a way that shows itself off as a centrepiece on the bike.” Keeping the original BMW scoop cover manages to keep the bike in line with the brief of making the bike look like it has rolled off the end of the production line in Berlin. And so it does. While we’ve seen quite a few ‘Nineties’ grace our pages in the past, we’re more than a little impressed by this, Brighton’s finest Beemer. 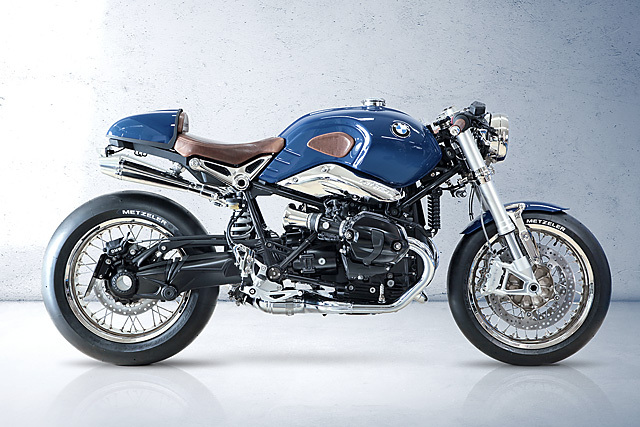 In a testament to Bavaria’s chops with metal and two wheels, it’s more obvious than ever that BMW’s skills to not only build a bike that impresses, but also one that also rewards those that dare to wrench are without equal. And we’re happy to say that both Rory and Stewart and now starting a little someone of their own called Pier City Cycles. Make sure you keep an eye on them. God know we will be.